My art gallery in Stellenbosch is home to hundreds of painted moments. Each of the paintings for sale in my galley have their own special story of inspiration. 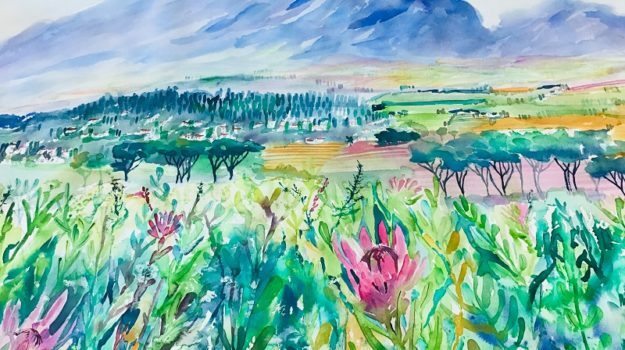 I’ve selected a few of my paintings to write about with the aim of sharing their story, my inspiration and the beauty found all around South Africa. 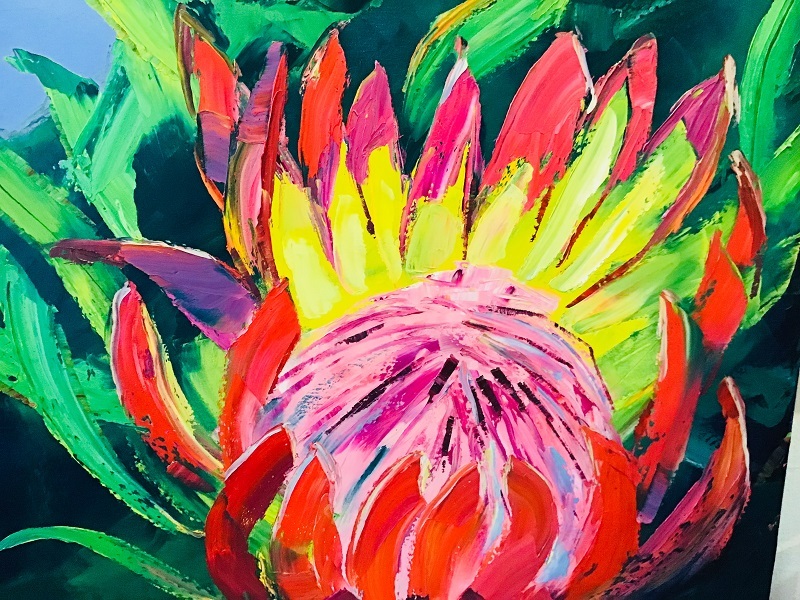 The below painting is of the mighty King Protea, a celebrated flower in South Africa. Also known as the Honeypot or Sugar Bush, or Protea Cynaroides in Latin, the King Protea is the largest of the Protea family. It grows predominantly in the Western Cape’s Fynbos Region and reaches up to 2 meters in height. I drew my inspiration from the bursts of deep crimson and soft subtle tones of creamy white and pink – colours true to Mother Nature’s elegance. The painting’s size is 90cm x 90cm. 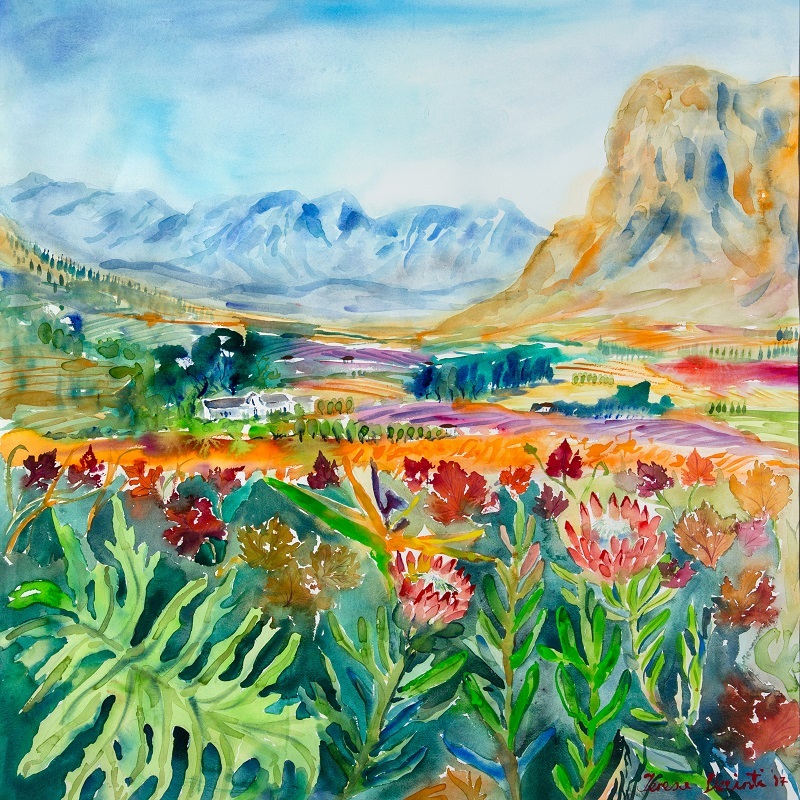 The painting below is a watercolour painting of the Groot Drakenstein Mountain Range as seen from the Dellaire Graff Estate. I can truly say, this is one of my favourite paintings. Additionally, I have had this artwork digitally printed onto pure silk scarves which are also available for purchase online or from my gallery in Stellenbosch. The painting’s size is 115 cm x 115 cm (framed) or 92 cm x 92 cm (unframed). 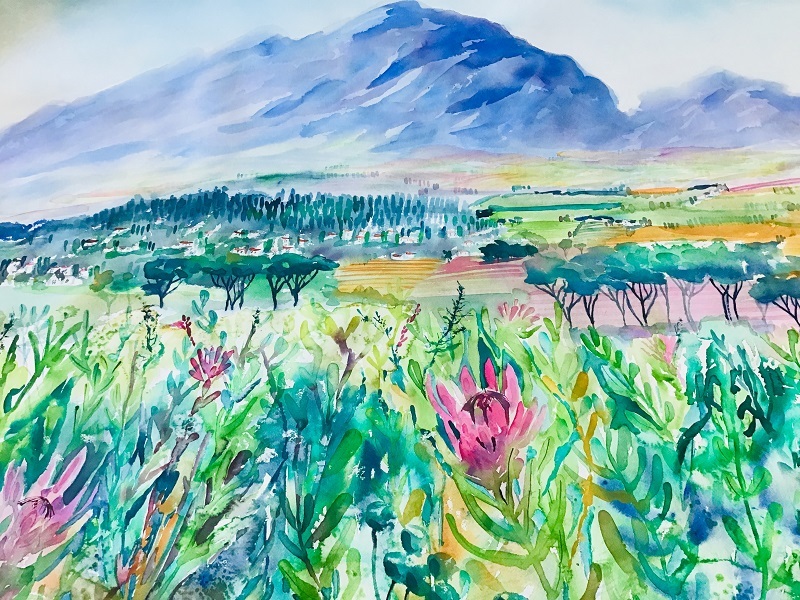 This is a watercolour painting that I did after a Sunday morning walk in the mountains of Stellenbosch. Throughout my walk I had a breathtakingly beautiful view of the Simonsberg Mountain Range and the whole mountain range of The “Twee Pieke” of Jonkershoek. Currently the Fynbos and Proteas are in full bloom and you will find hundreds covering the mountain range – it is a wonderful sight to see. The painting’s size is 1.6 metre x 1 meter. My love for animals is widely known by my friends and family. We often go on safari to the Kruger National Park and the Kgalagadi Transfrontier Park – it’s hard not to be inspired by the stunning scenery that surrounds you. 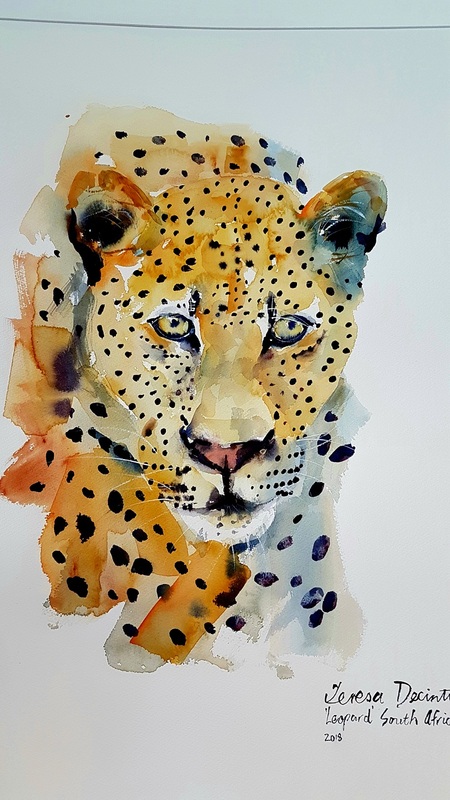 I love to paint animals using watercolour as my medium. It enables me to highlight their beauty and innocence by using soft loose strokes. Below is an oil fine brush painting of the Groot Drakenstein Mountain Range. It is of a view typical of our region in the Western Cape, especially around Stellenbosch. 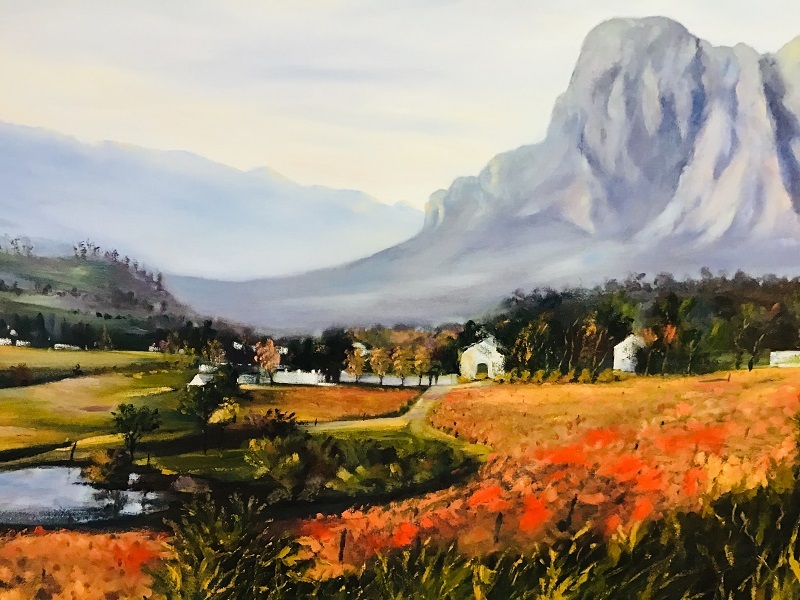 My inspiration for this painting came from bright mid-mornings in early Autumn – where the hazy Franshoek Mountain Range is seen in the distance. The painting’s size is 123 cm x 93 cm. Another one of my favourite depictions of the magnificent King Protea and its silky often silvery leaves. This plant is named after its shape that resembles a crown. The Protea has over 1500 species and is the oldest flowering plants in South Africa dating back over 300 years. The below painting is one out of two remaining canvases. The painting’s size is 90 cm x 90 cm. It’s safe to say that this botanical flower is often my muse for creativity. It’s known for its essence to nourish, restore, uplift and enliven. Additionally, it’s said to aid in processing childhood issues of abandonment and pain, letting go of the past and finding fulfilment and sweetness in life. I chose palette knife as my medium and the bold colours speak for themselves. It almost felt like I was putting the past behind me and making space to concentrate on my future. Colourful and bright! Each and every one of us need to be encouraged and accepted. We have an inner thirst to be cherished and acknowledged – it makes us human. 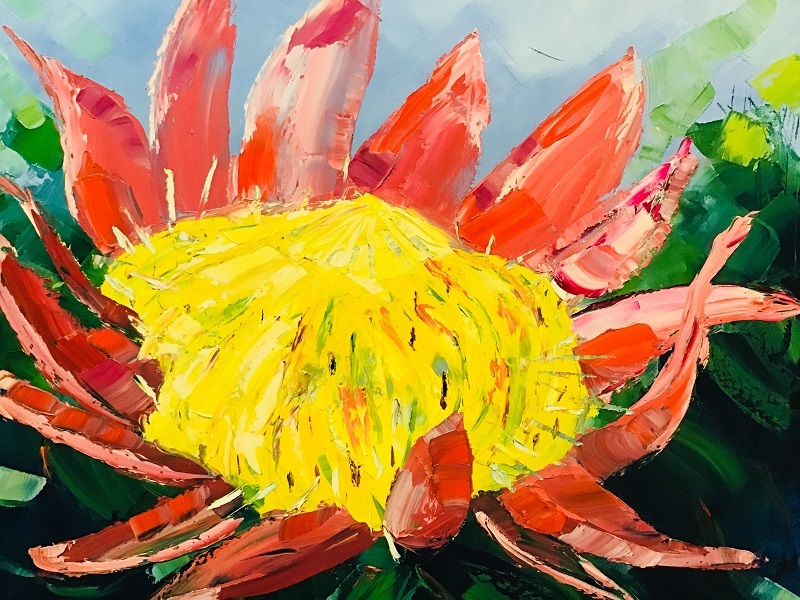 I feel a deep spiritual connection to this flower and I’m thankful to be able to express my creative connection through brush watercolour and palette knife oil paintings. Please note all paintings mentioned are for sale and can be couriered anywhere in the world. I have many happy international clients situated all over the world. 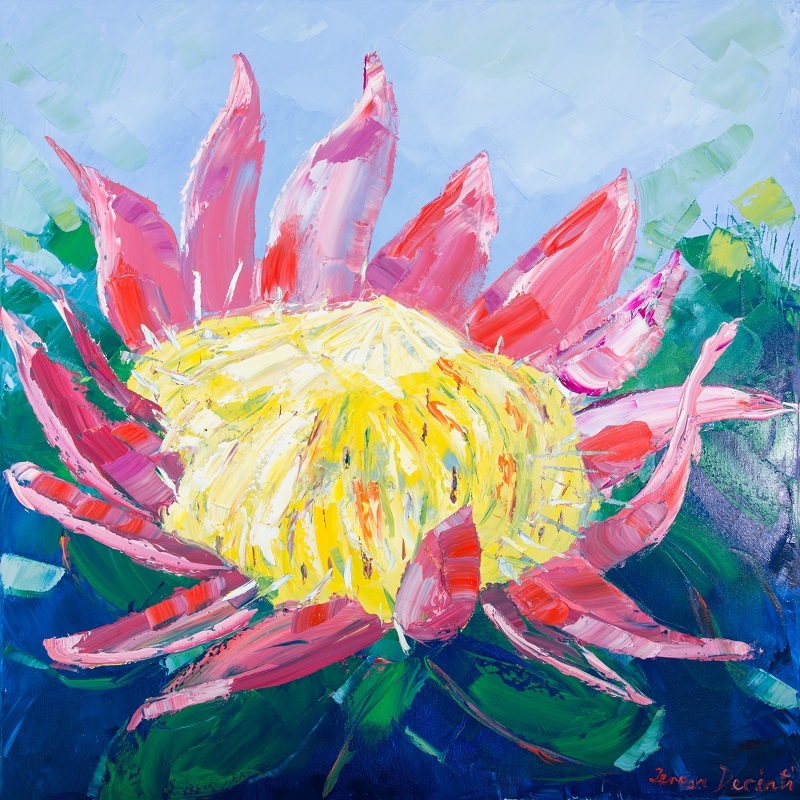 For more information about my gallery in Stellenbosch or paintings for sale, please feel free to contact me.